On some cases, we just want to password protect our page without including the hassle of heavy frameworks (like Laravel, Yii, Symfony etc) and databases. This solution works without any database and have credentials hard-coded in authentication file. You can add or modify accounts by changing php array values. 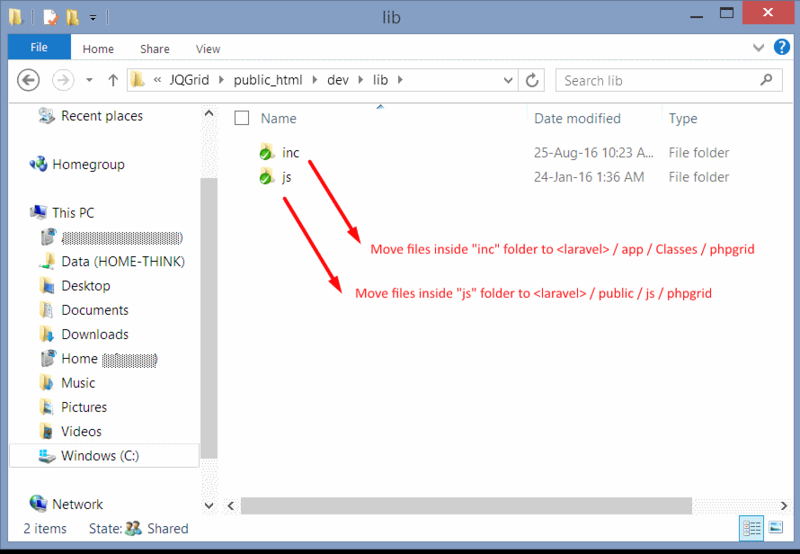 Refer comments inside file for configuration options. Download basic authentication include file here. Step 1) Include “auth.php” file on page which need to be password protected. Include before any output / echo and at start of code. Adjust include path accordingly where you place the file. 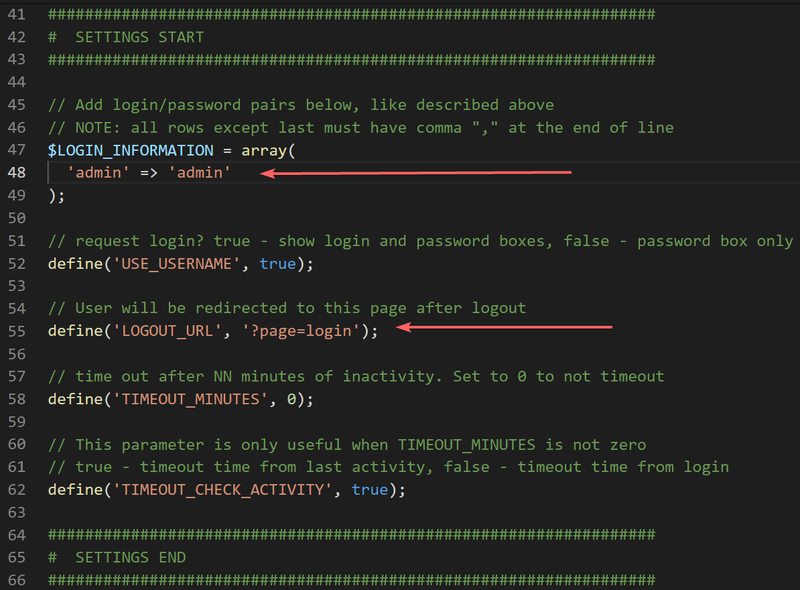 Step 2) Configure user/pass by editing auth.php – e.g. ‘username’ => ‘password’. You can also set after logout url. e.g. your login page url. 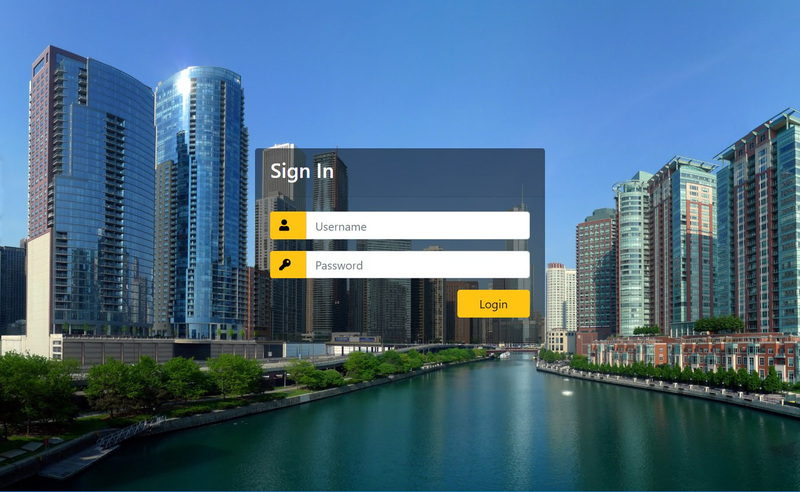 Result: Now when you access protected page, you will get following login screen. Entering user/password will allow you the access. 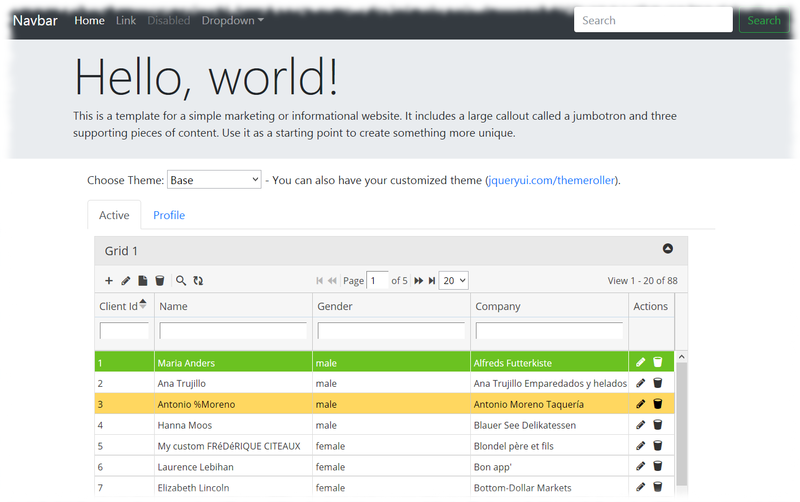 Feel free to change the appearance by modifying css files and hacking html code. 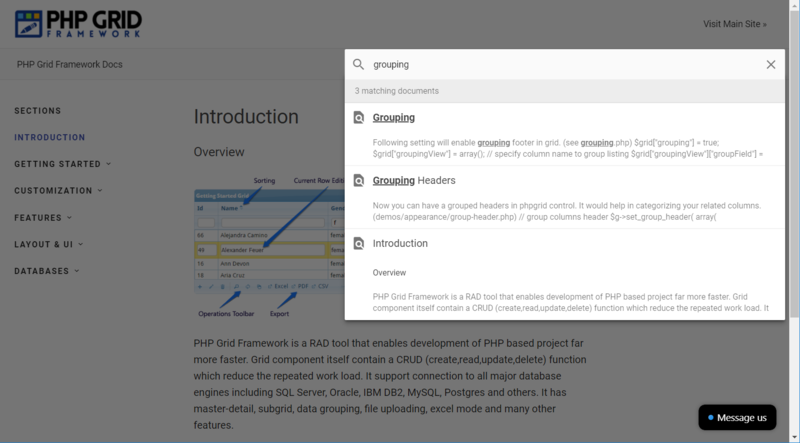 Another update for all, we just launched our new documentation section to improve usability and better understanding of our product (PHP Grid Framework). The new documentation site is categorized in content sections on left with a search box on top right. There is also a live chat / email message box on bottom right. To go to parent website use main site link on top. The most impressive feature is ‘quick search’ which is super fast (powered by lunr-js) and fetch results from every section of documentation in no time. Share you feedback and improvement suggestions as well. We recently added global search feature in PHP Grid Framework that allows to search your term in all searchable fields of grid. It will save time and quickly filter your data. Active license customers can request upgrade using this link. To purchase license, you can visit this link. 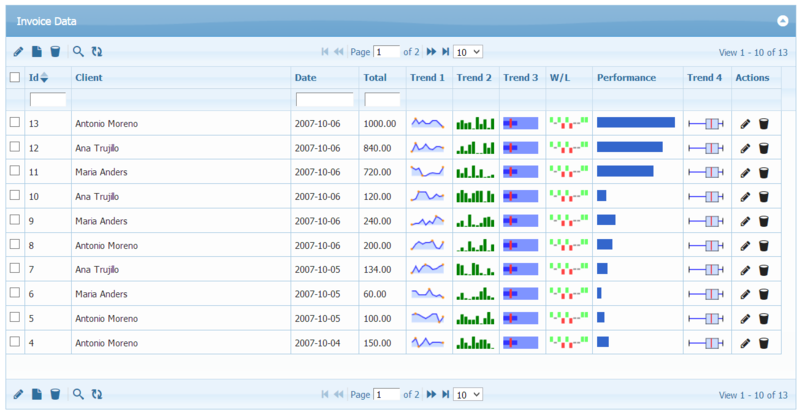 We’ve updated a demo that support displaying parent-child relational data in form of tree grid. It is done by simple configuration on PHP Grid Framework where you define the parent and child fields of same table. For example in following example, EmployeeId is ID field and ReportsTo is Parent Relation field that makes this tree grid. This framework already support variety of database connections e.g. SQL Server, Oracle, DB2, Postgres, Mysql etc so you can have this Tree-grid in all supported databases. Licensed customers can request free upgrade using update link. 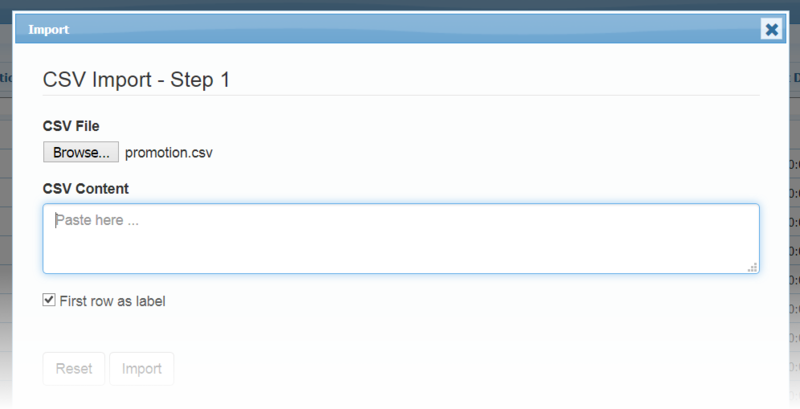 Added a demo that shows how to link lookup datagrid with your dialog form. Review screencast for more details. Step1: Folder placements in Laravel. The ‘app/Classes’ folder does not exist by default in laravel. You may create it for 3rd party class libraries. Here we included our library and rest code looks same as in our demos. Note the ” before class name while instantiating object. 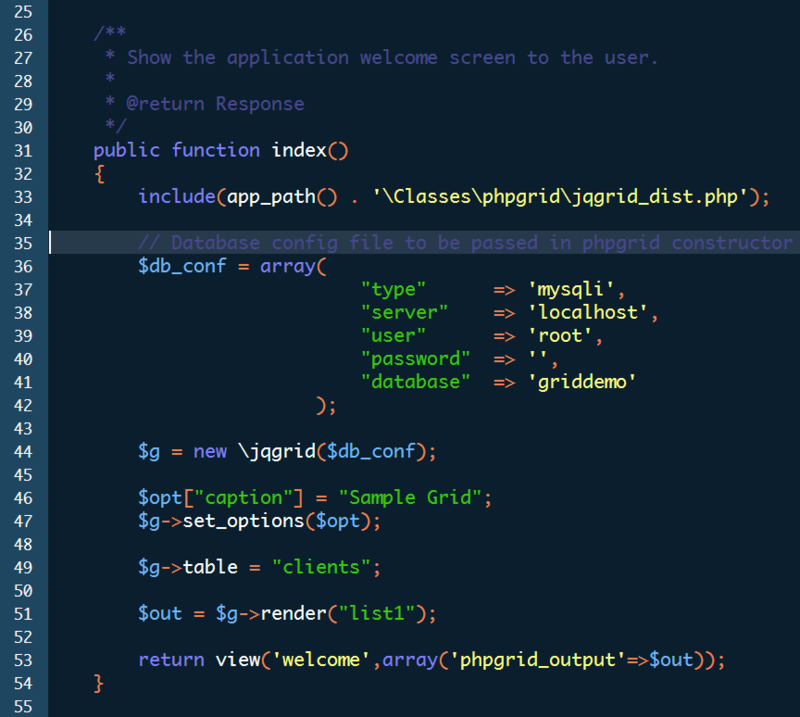 Finally we passed the output of render() function to view with a variable name ‘phpgrid_output’. We also included a meta tag for ‘csrf-token‘, that is required by laravel for POST operations. And using blade template variable output, we pushed the grid output in our desired place in html. The Last step in this tutorial is to set the routes to our controller. We will use both GET and POST routes as our grid uses both methods. Note: PHP Grid Framework does not utilize ORM model layer of Laravel. It uses it’s own backend libraries. 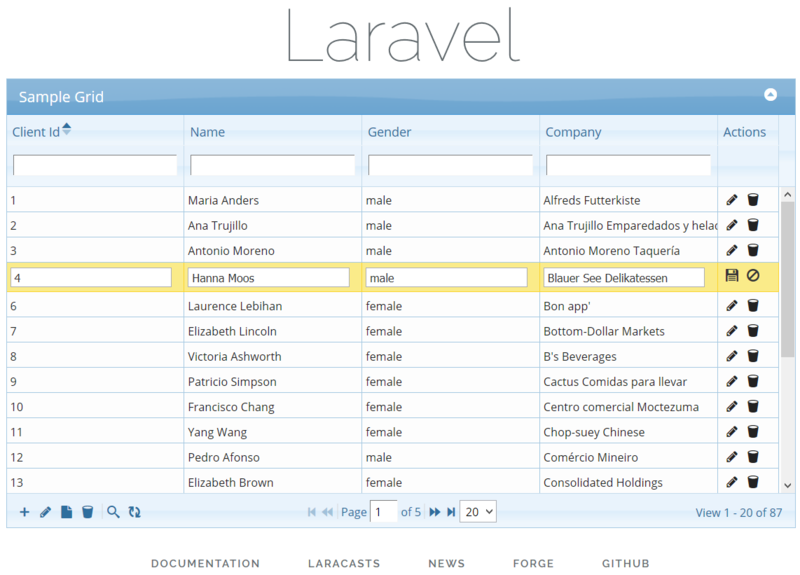 Result: Editable Datagrid for Laravel 5.5! 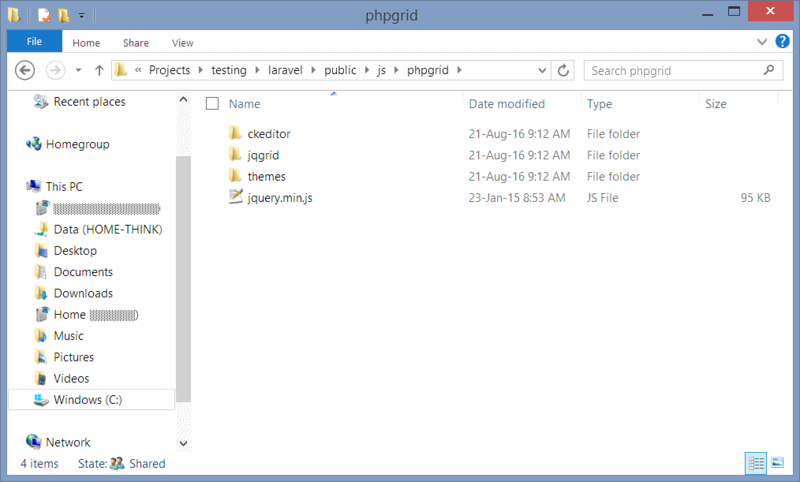 Download all files to kick-start Laravel 5.5 with PHP Grid Framework. 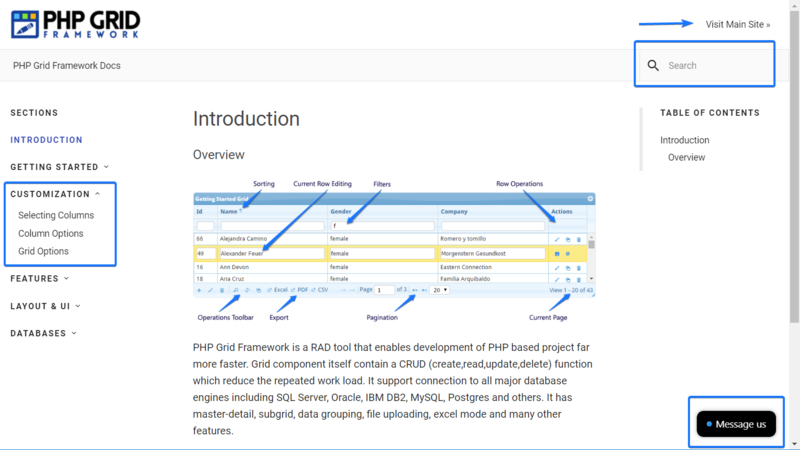 Note: Demo comes with non-commercial / evaluation version of php grid framework. You can buy commercial license from this link. 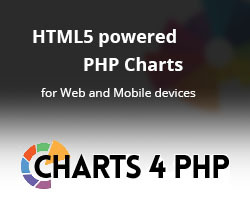 We’ve added support for visual representation of data using Sparklines in PHP Grid Framework. Sparklines charts can be used to show trends in a series of values, such as seasonal increases or decreases, website traffic, economic cycles, or to highlight maximum and minimum values. 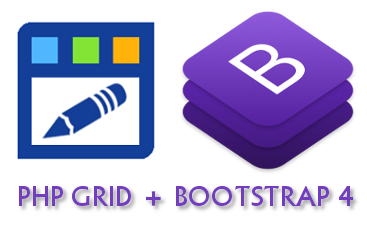 PHP Grid Framework is ready to use with Bootstrap4. Roll-out your next web-application with combining power of responsive PHP Grid and Bootstrap4 UI design. We’ve released ‘Import Data’ feature that will help customers who need to migrate from Microsoft Excel or Google Sheets or CSV File to their own web based solution using PHP Grid Framework. 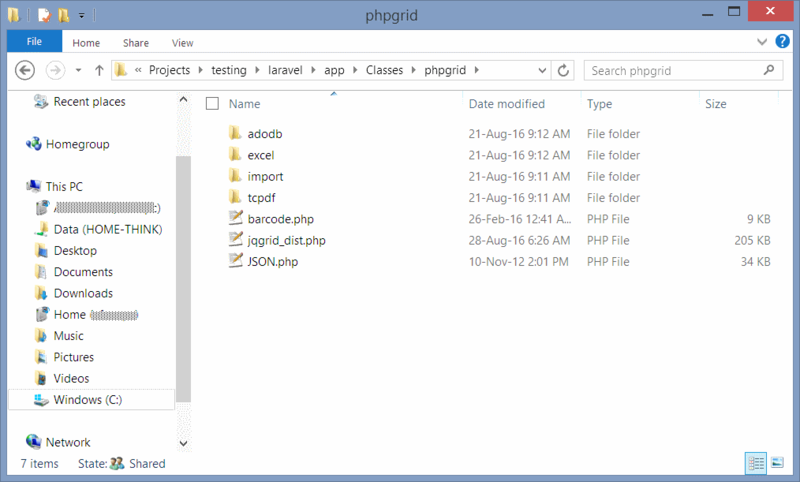 – Import your external CSV file data in PHP Grid Framework. 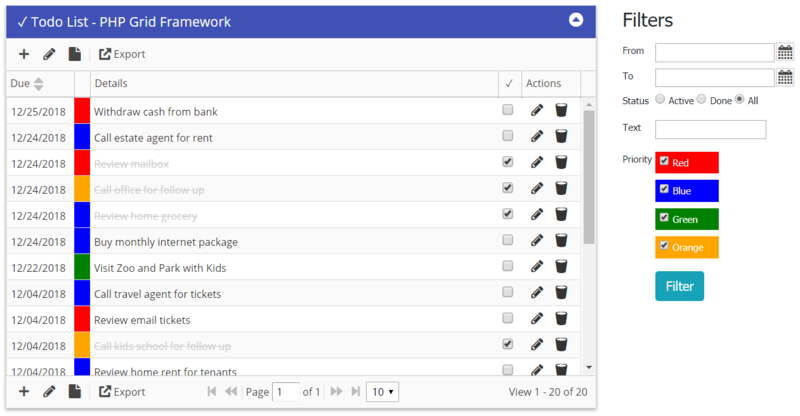 – Migrating from Excel or Google Sheets to PHP Grid Framework. 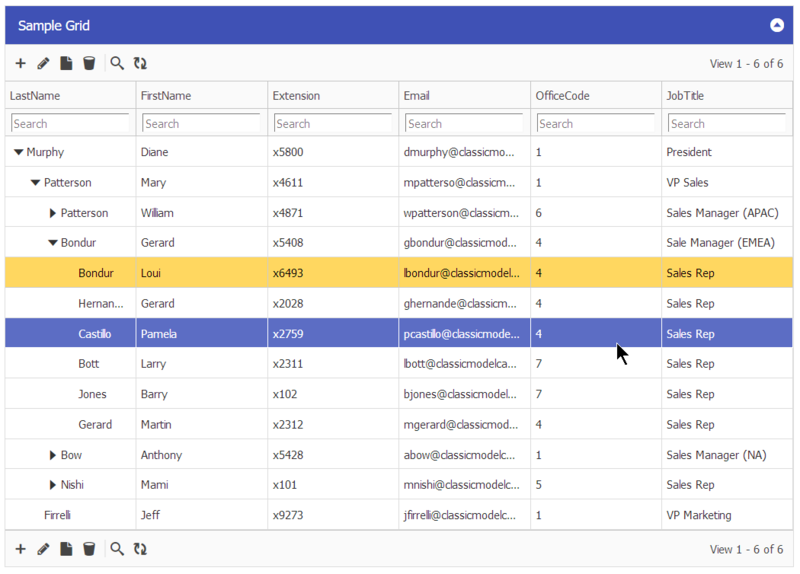 – Selection to map imported data columns on database fields. 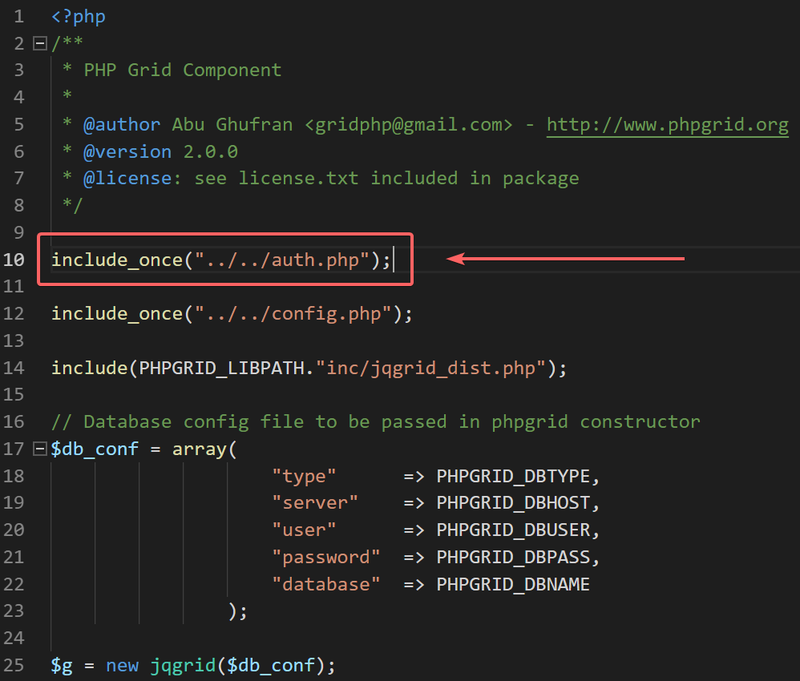 – Allow to Append OR Replace existing PHP Grid data. For How-tos, usage and technical details, refer updated documentation. Existing customers can request update from this link.